Cat’s Meow’s thoughts on skimming the surface of clutter. Kimberley believes in quality over quantity. Gotta love this comment from Jane she said it the way I think it. Sadly I feel inclined to be slightly more diplomatic at times ~although I can get a little cheeky ~ but God bless you Jane you just said it how it is. Here is some more simple yet helpful advice from Mohamed at Midway Simplicity. It is good to see I am not the only blogger repeating the same message over and over again. This message is worth being reminded of over and over again. Here is a great article with tips on how to get rid of your stuff including getting it valued before selling. Round up all your hair accessories ~ These tend to end up scattered all over the place making them impossible to find when you need them. They end up in school bags, handbags, bathroom drawers, bedside cabinets, in the little nooks and crannies in the car, sports/gym bags, coat pockets and even under the sofa cushions. I own four hair clips but at the moment I only know where two of them are and they aren’t my favourite two. This little storage container was no longer needed. It is roughly 9″ x 5″ x 2″ (230 x 130 x 50mm) and was full to capacity with pens. How many pens does one household need. The bulk of the pens were decluttered long ago and this container moved down into the pantry. It wasn’t getting used so off to the thrift store it went. My little boy turned 21 today (now yesterday). That is almost two more years than we thought we would have him to love and cherish after his terrible accident in 2010. Words can not describe how grateful I am to be able to celebrate this day. « Clutter ~ What is it worth? I haven’t ever sold things on E-bay or Amazon. Is it really worth the time and effort? I have donated so many things, and some have been worth a lot of money, especially if you add them up. Have you found the time and effort it takes to be worth it? Thanks for your opinion. Good question Spendwisemom. I suppose I wouldn’t keep doing it if I didn’t think it was worth the effort. If I thought too much about how many dollars per hour I make out of it I would probably stop though. The biggest effort involved is listing the items and that is pretty involved. You need to work out a starting price, photograph the item and save it to your computer, weigh the item and estimate the postage, you also need to title the listing and write a description ~ all very fiddly and time consuming. Then if the item sells you have to package it up and post it. If I feel content in the end that I recouped a reasonable amount of money on an item to placate my quilt or any doubts about getting rid of it then I suppose that is the payoff that makes it worth the effort for me. Keeping in mind that I don’t have a paid job so I have plenty of hours in my day to do this sort of thing and extra cash is always nice. If my choice is listing on ebay or just sitting about watching television in the evening it isn’t hard to figure out which for me is the biggest waste of time. Hi Colleen – yes you are right it is a low hourly rate, but it is another method of getting things out the door. I was just telling Spendwisemom above that I have a friend on maternity leave who is making $150-$200 a week off selling stuff. What really surprises me is that she’s a long term minimalist and I don’t know where the stuff is coming from! She says there is always stuff that can go (ie as their baby son outgrows clothes and the girl clothes they saved from the first) and now that they have a 2nd child they had to realistically look at how many recreation items they would use over the next 3-5 years. So while I’m selling stuff that’s been hanging around for 3-5 years, they are making pre-emptive strikes at their lifestyle. Ironic isn’t it! One thing is for sure Moni, no matter how frugal a person is, when there are kids growing up within the family there will always be something to declutter. So why not make a few bucks out of it if you can in order to pay for the next round of necessities. Hi spendwisemom – I am the first person to put my hand up and say that selling on ebay/amazon/trademe takes a fair bit of time. BUT it is also a very direct method of re-cycling stuff out to people who (hopefully) want it. I consider it another method of recycling even though there is a money transaction involved, as stuff gets another lease on life. I also use freecycle and the goodwill charity-bins. I have used trademe (our version of ebay) a lot this year as part of my decluttering programme. I have sold a lot and made a nice chunk of money – with three teens this is always welcome. When I listed our old dirt bike gear, I listed it just before the season started, likewise the snow boarding gear. Dance gear sells better at the start of the year. After doing Project 333, I sold a number of clothes that I decided if I wasn’t going to wear them, then someone else should. A lot of them went to a lady returning to the workforce. The girl’s outgrown clothes – the majority were handed down to a friend for her daughter – but some items went on Trademe – not huge money makers but the girls enjoyed watching the process. Last year I started listing sets of children books, and a lot went to buyers in Christchurch who were replacing households after the big earthquake. At the moment I am gathering up school uniform items around the house. Anything too small or surplus will be listed in December/January as the enrolments for 2013 will be finalised then. None of the dirt bike, snow board & ski suits, dance gear went unsold. Clothing and books have a 50/50 success rate and its not always the obvious items that go. The majority of items go by 3rd listing. Anything unsold at that point gets donated. I don’t like to have more than 10 items max listed at a time otherwise it can compound at posting time. I still have trademe “campaigns” planned for next year but I prioritised the gear that I was (a) in time for the start of the season and (b) that was the biggest nuisance hanging around my home. The stuff that is going on next year will be in place for the start of its season and will take a lot of faffing around with extensive descriptions and every conceivable measurement (ballet costumes) and I will do that over Jan/Feb for the start of March. To do it now, they wouldn’t sell as the season is nearly over and it would take me away from my bookcase & dvd cupboard mission. Ebay/Amazon/Trademe – they definately have their place but its not money for no effort either. I have a friend who is on maternity leave and every week she is making $150-$200 a week off selling stuff as a way of supplementing the family income but she says it takes quite a bit of time. So she’s just considering it her part time job at the moment. Ebay vs. Amazon: BIIIG difference. Amazon is almost no hassle (for books, cds, dvds) and may fetch awesome prices. Listing is free, too (at least over here) and it’s fast. I don’t really mind to have a little Amazon-stack around. Con: Things sometimes hang around for long and all have to be mailed individually. So I only do it for the higher priced items in good condition. Ebay is a different story and I hate the hassle as much as the next person. What works for me: I have a price limit which I consider when thinking about whether selling or not. If the thing is not likely to fetch at least this limit than it’s not worth my effort. Which absolutely doesn’t mean those things are bad and can’t be sold at a fleamarket or a thriftstore but with shipping costs some things would just be an instant fail at ebay. I think it absolutely depends on your available time and your money situation how you set this limit. But don’t be sad about the probable value of the things given away „especially if you add them up“. 3$-pieces on ebay can add up to 300 $, yes, if you sell (and pack and post) 100 but unless one sells profesionally it would drive you mad. Ebay & the selling process is time consuming without a doubt. After photographing, listing, boxing up for shipping, dealing with buyers, tracking mailed packages & paying Ebay fee’s (in the US, Ebay charges for listing the item whether it sells or not). But if you list like items (items within the same exact category) at the same time – it can go smoother & quicker. My method of listing items has improved – but my method may look very different from the next person. You’ll find what works (& what doesn’t) for you as you go along. Total netted after paying fees $446. Total time involved in listing items came to about 4 hours. No, I don’t try to calculate what my time is worth in determining the final value as I just can’t come up with any solid numbers that makes sense. It always tends to be a bit esoteric & I’m more the hard true data type. So is/was it all worth it? For me, yes. I netted $446 US. I’m sure the number cruncher folks would argue that I didn’t make enough for my efforts…but at the end of the day, I had $446 more in my proverbial pocket. Can I ask what you would estimate you initially paid for all those items? This last round consisted of clothing I’ve been super hesitant to part with but finally did obviously. I looked over the items & would guessimate about $1000 US. Lots of Anthropologie clothing & a few “designer” things. Stuff I had no business buying to begin with especially considering what a laid back/non-designer lifestyle I lead! The week before that round of auctions, I listed & sold a bunch of decorative accents/kitchen doodads & what-nots. I sold over 40+ items which I guesstimated at about $900 US. I ended up making a little over $400 as well. My buying habits were once quite over the top to say the least. I made good money & rewarded myself for my efforts & good fortune. I was unabashed there for awhile buying the latest greatest anything & everything. My mantra was: “whoever said, money can’t buy you happiness – didn’t know where to shop!”. I’ve since come to my senses. Luckily & thankfully, I’m now debt free, but I could have more in my investment/savings accounts without a doubt! Trust me, I’ve done a fantastic job at beating myself up for my foolish spending in the past….but once I got past the horror & self-imposed guilt of having bought so much crap…I vowed to never go there again & never do such a foolish thing again. So I dusted myself off & began to systematically get rid (selling, donating, etc) of anything & everything not necessary, vital or loved. When I first starting selling off stuff, I got rid of the obvious things I didn’t like. But once I started staring down the barrel of things I kinda liked or felt guilty about having spent so much money….well it got tougher & I struggled to keep pressing on. But pressing on I did & now it’s ridiculously easy to part with the once-expensive stuff as it is the cheap stuff. The husband & I are seriously considering moving aboard a houseboat down in the Florida Keys. But even if we buy a “regular” house down there…we now know we don’t need or use most stuff we already own. So this is where Ebay comes in. I’m not only decluttering in order to downsize…but I’m also trying to recoup some monies for my spending spree’s of yore. Spendwisemom, I only bother with things on ebay if I think I can get a reasonable price. I don’t bother for a few £’s here and there. Sometimes, ebaying feels too stressful to be worth it and I just need the item out of the house pronto, and othertimes, it isn’t so stressful: photo, accurate description, job done. I generally prefer items that are ‘for collection only’, as I find the wraping up/posting a hassle. Some great comments and links. I especially liked the Forbes article. I think that would be handy for everyone to bookmark so that they can refer to it when needed and also pass it along to others. Spendwisemom, I don’t do much about selling things unless my Mom won’t let it out of the house without money. If it was just me I would just give it away. I know that some things might be worth money but to me it’s not worth the hassle. Ah, well! At least I can get rid of them if I sell them. Grin. Thank you so much Colleen for sharing my article. It is always my pleasure Mohamed. Thank you for sharing your wisdom. Agh hair accessories – despite what i said on Monday, this week, they’ve seemed to spread! ‘Cause of my failed haircut (unevenly too short) I can’t use the usual clips, so now I have an elastic + bobby pins. But I get jack of it all watching TV, so they end up on the arm rest… I’m being extra mindful when I need either, to start there, and clear off what I’ve left the night before, rather than seek out ‘new’ ones from their usual homes. The Forbes link suited this week’s topics, but then, maybe got peple back to thinking ‘I can make a mint’ (let’s hope not!) I like Mohamed’s idea of limits – I think more in limits of space: if I can’t ‘house’ it, then I don’t want it (namely with kitchen stuff, and linens, and clothes… And DVDs/CDs don’t have a home in my place, so my limit is 0! except for library loans). Becoming minimalist’s first point is the key to me this week – spending too much money. I’m attempting a spend free week – in the sense of ‘stuff’ or luxuries (eating out). I shall buy groceries, and pub transport is ok. Bout it at this stage – oh and health costs. I still haven’t found my missing hair clips. I thought for sure they would be in my handbag or on the floor beside my bed but alas. Oh well two is enough even if they are getting old and ugly they still do the job. They can barely be seem among my crop of hair anyway. I thought that Forbes link was interesting too. I see no problem with trying to sell stuff and have it realise its worth but the thought of being left to sift through a house full of it when a loved one dies does not appeal to me one little bit. If I can encourage more people to deal with their clutter now so loved ones aren’t left with this mess the better. I am just glad that this situation is unlikely to happen more than twice in my life and even that is two times too many. A sure fire to find small accessories you’ve misplaced is to run out & purchase new ones – then miraculously the old one’s show up! Great links for Fridays Favs. The link to the Forbes article was particularly interesting; and extremely confusing! Gains, appreciation, taxation, it does kinda make my head spin. After reading that I realize how important it is to live for the today/now in a very minimal and simplified life (for one thing it sure is easier on the USA taxes). As for the daily declutter (hair items), since my hair is so very short, I don’t even own a brush or a blow dryer, so no need to declutter there. However, I did drop off a load to the thrift store of bathroom decor items that had been sitting around in the ‘hopes I’d use it some day’ situation. If I haven’t put the energy into it over the past several months, then it is a project that is just causing me stress (of having to do it). I simplified the bathroom decor and someone else can benefit. Every time I declutter something I can be content in knowing not only am I doing myself a favour but I am doing the kids one too. They will know that what is left is either useful or valuable and won’t need to put much thought into it. Some day’s I wish my hair was as short as yours Annabelle but alas I like too much like a boy with short hair so I shy away from it. As for bathroom I think that is one area of the house that is best left as minimal as possible. The fact that we have a tiny ensuite leaves us no choice by to comply with my feelings on this. I’ll drop in again to share my ebay thoughts (and these are only mine, and in no way am I an ebay expert!!!). Over the past several years I have used ebay. The items I sold had significant value (and I detest that I even spent that much money on them to begin with!!! What. Was. I. Thinking? I wasn’t!!!). Anyway, I did recoup enough to make it out about even. If that money had been in the bank or invested it would have gained more in interest, however. As for the little stuff, either have a garage sale (I don’t have time) or just give it away as appropriate). The part about recouping money for selling stuff all boils down to the fact that we’ve already lost money buying stuff. STOP BUYING. End of story. Cut your losses and get it out of your house. (remember, just my opinion!). Mohamed’s post about limits really spoke to me. By living within limits, I can more easily focus on the truly important things in my life. Instead of thinking “oh I need to check my email for the 4730284932 time today”, I set a limit on how often I check it and then focus on spending time with my family, friends, pets. Or focus on reading a book. Or gardening. Or watching the hummingbirds. I have that exact same pencil box! I use it to hold jewelry supplies and keep things separated. (All of my jewelry supplies are contained to a single box, about 12*12*8). I’ve been meaning to find a different box soon though, but I don’t have one yet. Someday soon I will have an identical pencil box joining yours in the decluttered world. 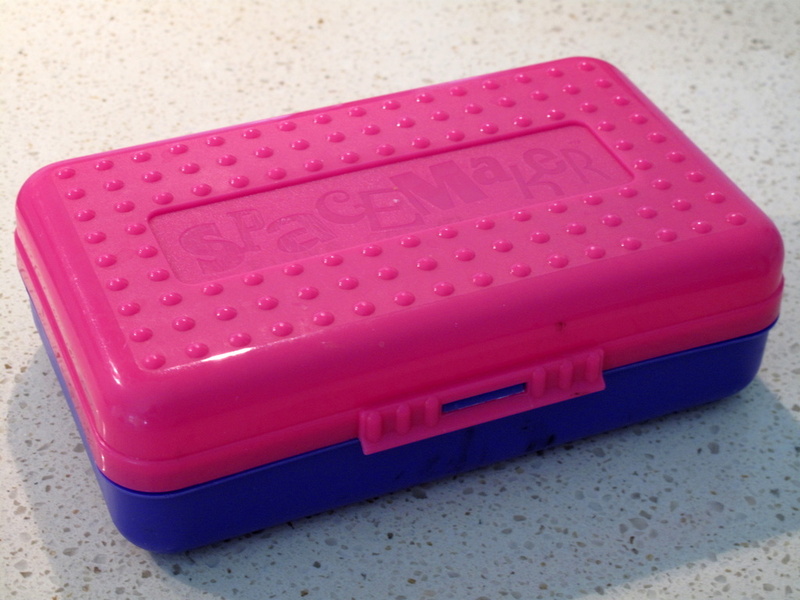 Mine was first used as a lunch box, then to keep batteries and then pens, so it did get constant use. No need for it now thou because we have so much less stuff and no little kids needing lunch boxes. Yup, mine’s been in use too, but it’s just too bulky for what I need now. I got it WAY back when I was like 6 or 7, and have used it for 2/3 of my life. I’m just waiting for the right size box to come along and replace it.